Talon Therapeutics announced that Marqibo (vincristine sulfate liposome injection) received accelerated approval from the FDA for the treatment of adult patients with Philadelphia chromosome negative (Ph-) acute lymphoblastic leukemia (ALL) in second or greater relapse or whose disease has progressed following two or more anti-leukemia therapies. The accelerated approval was based on data for overall response rate. Clinical benefit such as improvement in overall survival has not been verified. Marqibo received orphan drug designation for the treatment of ALL from the FDA and from the European Medicines Agency (EMA). Talon Therapeutics intends to submit a Marketing Authorization Application to the EMA in 2013. 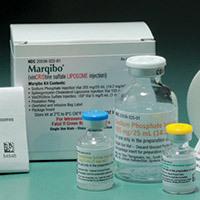 Marqibo is a novel sphingomyelin/cholesterol liposome-encapsulated formulation of vincristine sulfate. Vincristine, a microtubule inhibitor, is approved for ALL, Non-Hodgkin’s Lymphoma (NHL) and is used in combination regimens for a variety of adult and pediatric hematologic and solid tumor malignancies. For more information call (888) 292-9617 or visit www.marqibo.com.